It was a great day when improved gas mains and supply came to Fleetwood although a Gas Company was formed on 8th October 1840 with Charles Woodbine, foreman and William Woodbine, labourer. Abel Woodbine, ‘labourer’s boy’, was paid four shillings a week. The gas holder then in use was 38 feet in diameter, 18 feet in depth, and there were constant complaints as to quality and supply of gas. 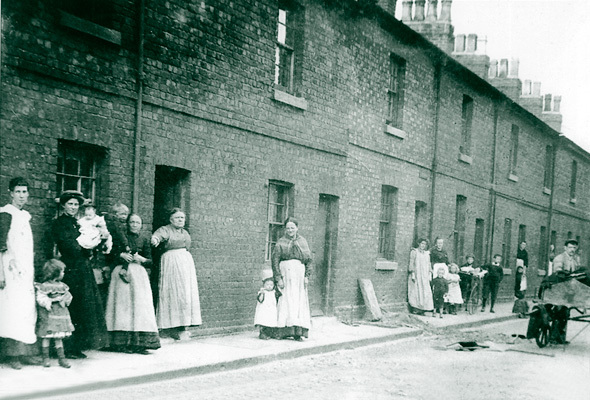 These ladies in Cop Lane about 1910 expect an improvement in town gas. Oil lamps had to be used on innumerable occasions, for Dr Bird, Medical Officer of Health, thought the supply injurious, the purifiers not working, as he had tested samples and found sulphuretted hydrogen and carbonic acid. Mr Beesley, the gas manager, was fined £20 and even in 1918 there were letters complaining of poor street lighting, referring to the new Gas Company.